This sterling silver and marcasite watch pin features a horse drawn coach. The coach door opens to reveal a quartz watch that is mounted upside down, so that the wearer can see the time easily. 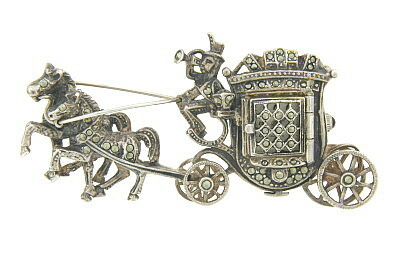 The intricately detailed pin is complete with a natty dressed driver blowing a horn to announce his arrival! This pin is as beautiful as it is unique! The piece measures 2 1/2" in length, 1 1/4" wide.